In addition to keeping up with what’s new in technology, I keep an eye out for content that is particularly relevant to my psychology students. Rather than dig through the Internet for content, I have Inoreader fetch the content for me. This is what Inoreader looks like. On the left, under “Subscriptions,” you can see some of the content I’m subscribed to. 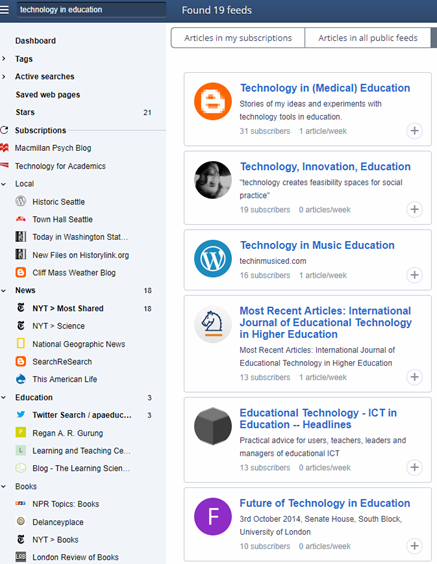 Inoreader periodically visits these websites looking for something new. When Inoreader finds new content, it drops it in here. 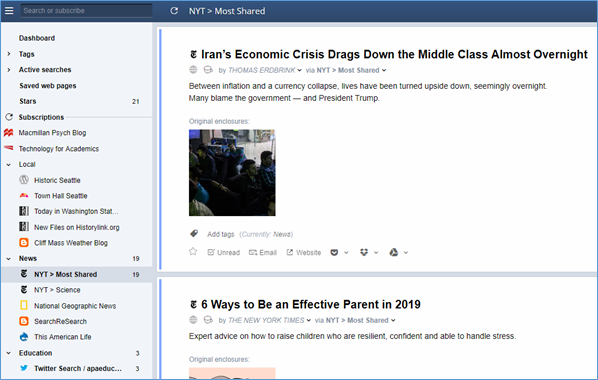 You can see that I have a “News” folder that contains a subscription called “NYT > Most Shared.” These are articles the New York Times has identified as a “most shared” article. Right now there are 19 such articles waiting for that I have not seen yet. To navigate through this list of articles, I can scroll down, or I can jump from one article to the next by using my keyboard. “J” takes me down to the next article in the list. “K” takes up to the previous article. To read an article, I click on the article title, and my browser will open up a new tab to show me the article on its home website. In this example, I’m taken to the New York Times website to read the article. The mobile app is just as easy to use, and the interface looks very similar to what you see with your computer’s web browser. Inoreader will sync across all of your devices. I usually use Inoreader on my Android tablet, but will sometimes use it on my phone. And if I’m at my computer, well, I’ll use my web browser to open Inoreader. In the top right corner, click in the “Search or subscribe” box. Inoreader will show you a bunch of categories. Click on each category to browse. After clicking on the “US News” category, of the 26 options Inoreader gave me, I chose “BBC News – US & Canada.” If you want to see what kind of content you’ll get, click on the name of the card, e.g. “BBC News – US & Canada.” If you like what you see, click the green “Subscribe” button at the top of the page. Inoreader will give you a yellow bar at the top informing you that you are now subscribed. From that same yellow bar, you can choose to rename it something other than “BBC News – US & Canada,” you can add it to a folder (my “News” folder is a promising location for me; scroll down in the folder pop-up menu to find the option to create a new folder), and you can add a filter. A filter allows you to filter the articles Inoreader delivers to you by either content you do want or content you don’t want. This is the list of subscriptions relevant to my search term that Inoreader found that other Inoreader users are subscribed to. 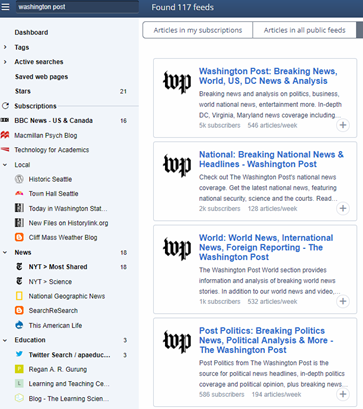 Search using the term “Washington Post,” and you will get a list of all the types of articles the Washington Post is happy to send you. Most blogs are written on a platform that allows their content to be fetched by Inoreader. Paste the url of the blog into the search box, http://suefrantz.com/. Select the “Add feeds from…” option. Choose the top one, “Technology for Academics,” to have Inoreader fetch my new blog posts. 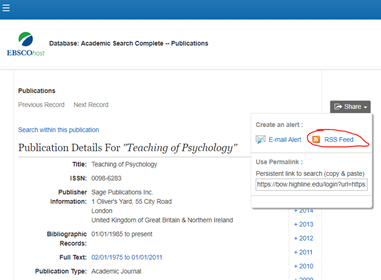 You can subscribe to journals (or searches) using your college or university’s library database. Each database is different, so if you run into any trouble, your librarians will be able to help you out. Here’s an example from the EBSCO database. I found one of my favorite academic journals, Teaching of Psychology. On the far right, clicking on the “Share” button tells me that I can choose between an email alert and an RSS feed. In Inoreader’s search box, paste that url. Your database may even happily send you not only article titles but also abstracts. Here are EBSCO’s instructions on how to do that as an example. But really, talk with your librarians. It will be faster. Now that you have a lot of feeds set up, you’re probably ready to get rid of some. Where they’re listed on the right side of your Inoreader screen, right-click the one you want to delete, and select “Unsubscribe.” That’s it. Inoreader is free, but for a small annual fee, you get additional features. For most the free version will suit your needs. For me, the free version would probably be fine, but this is such a useful tool for me, I wanted to support the developers. I went two tiers up, bypassing the “Starter” level at $8.99/year and signed up for the “Plus” level at $17.99/year. This pricing is available through January 6. After that, you can expect it to return to non-sale pricing: Starter at $14.99/year, Plus at $29.99/year. Once you create an Inoreader account and log in, click on the gear icon in the top right corner. Select “Preferences.” Choose “Billing and usage.” At the very top of this page, on the “Subscription plan” line, click on “Upgrade now.” You’re not committing to upgrade. This is just how you get to the page that shows you pricing and the features that come with each tier. 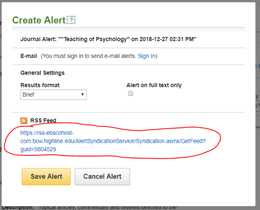 In my next post, I’ll tell you how I integrate Inoreader with Trello to keep track of the articles I might like to use in a future edition of my psychology courses.